Joining the likes of Daughter and Michael Kiwanuka as graduates from the Communion Records ranks, To Kill A King have finally released their debut album on EMI. 'Cannibals With Cutlery' comes a good three and a half years after they formed in Leeds - moving to London since to tread the golden paved roads, befitting the rich orchestration and vocals of the band. 'Cannibals With Cutlery' begins solemnly - the drab melancholy of string-laden opener 'I Work Nights And You Work Days' unexpected compared to my previous experiences with the band. Perhaps ironically, the sprightly opening of 'Funeral' hints at brighter things. As the music lifts and crashes triumphantly, the album finally feels like it has opened us up to the true spirit of To Kill A King - even making some of those early Arcade Fire comparisons seem somewhat apt. 'Cannibals With Cutlery' mish-mashes its way through different emotions, flailing in melodrama before rejoicing in heartfelt embrace, never quite knowing which state it suits best. But perhaps that's a fair reflection of the human condition itself. Regardless, the album is rescued by the frequency of quality songwriting on offer - such as six and half minute stunner 'Choices' and the beautifully sombre folk of 'Children Who Start Fires'. The atmospheric production is problematic, with the more expansive and glossy nature of the album tracks compared to their former incarnations often overpowering Ralph Pelleymounter's gloriously rich vocals. 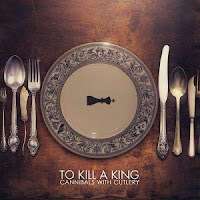 'Cannibals With Cutlery' typically struggles to balance its quiet and loud moments, and the somewhat inconsistent tone arguably can be attributed to the array of producers on offer - Jim Abbiss, Charlie Hugall and Andy Green all involved at some point. At close to an hour in length, I suspect had To Kill A King opted for a tighter tracklist and a sole visionary producer, their debut would have been one of the albums of the year. As it is, 'Cannibals With Cutlery' is something of a middling effort. 'Cannibals With Cutlery' is out now. Find more info at tokillaking.co.uk.